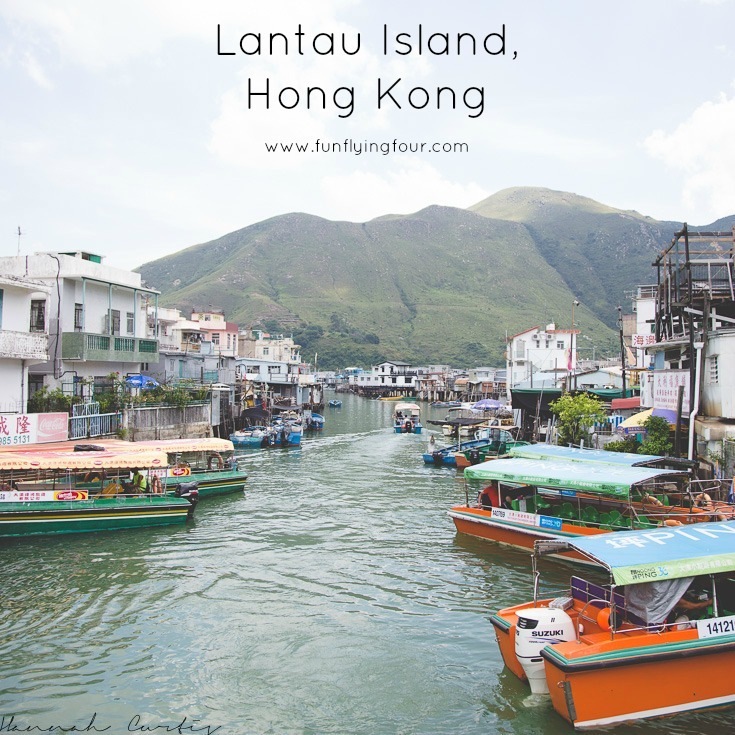 One of the more popular things to do in Hong Kong is to take a trip to Lantau Island to visit the Big Buddha (Tian Tan) so naturally with a week in Hong Kong this made it on our list. I am not going to lie, I wasn’t overly excited about it, although I did think the glass bottom cable car ride there (and back) would be a hit with the kids. 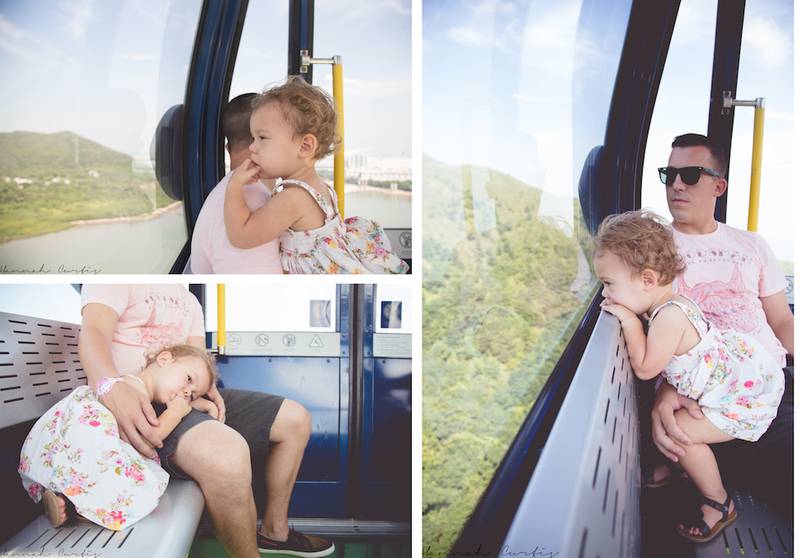 As it turns out they weren’t too bothered with the cable car. We were blessed with a clear day so the views were amazing and it was pretty neat seeing people in fishing boats beneath us as well as those hiking, I am pleased we decided to spend a little extra and get the crystal cabin cable car as opposed to standard. The cable car trip was a lot longer than I had anticipated (25 minutes/5.7 km’s) and I often thought we were coming to an end but it just kept going; you definitely get your monies worth! I was also surprised that there were no queues; I purposely pre-booked online to avoid the queues but we could have easily turned up without tickets and not had to wait. When we finally reached the top instead of heading straight for Tan Tian we took a short bus ride (bus number 21) to Tai O Village, this, I was excited about! I knew that Tai O would be one of our must see’s/do’s when I was researching about Hong Kong and it definitely did not disappoint! 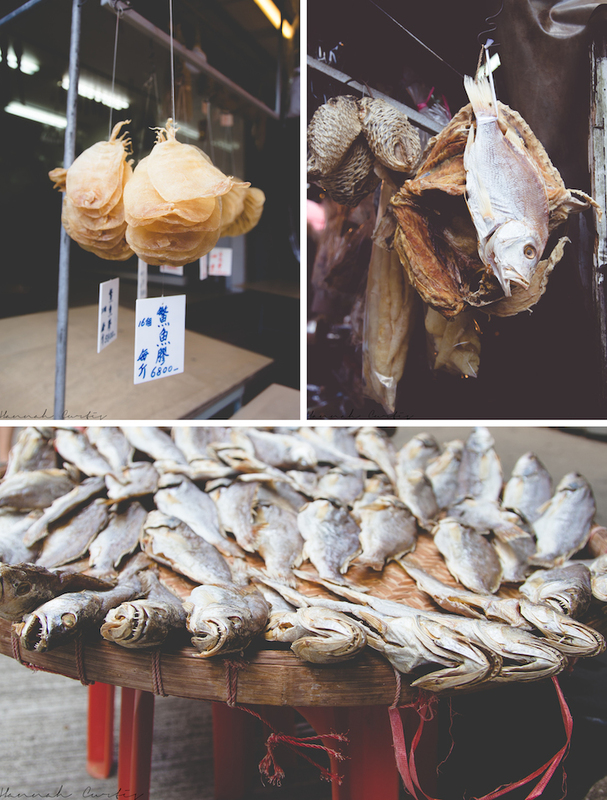 The smell of drying fish hits you as soon as you disembark the bus which does get a bit overwhelming and towards the end of our time in Tai O Eden was over it. We wandered through the village until we reached the boats and jumped on with high hopes yet zero expectations of seeing the pink dolphins (also known as Chinese white dolphins) although before we went dolphin spotting we cruised the waterways to get an intriguing glimpse of what life was once like in this traditional fishing village. Stilt houses still stand along the waterfront although many have been destroyed in a fire. There was a young child fishing from one of the stilt houses, I loved that he gave us a wave as we drove past. We also got a glimpse of a man making what I presume was a fishing net. After 10 minutes we sped out to the bay eager to spot a dolphin; I purposely did not tell Eden about the dolphins in the event we didn’t see any so when we did see a pod it was amazing and her reaction heart warming. The boat idled there for a good ten minutes and we watched the dolphins jumping in and out of the water. I tried once to get a photo but it didn’t work, all I got was a splash! As much as it was wonderful to see them it was also sad; in the distance the bay is full of ships, barges, tug boats, container ships and cruise ships; it is estimated that over 70 vessels come through the water way every hour. What I didn’t know about the pink dolphins until I returned home is that they only started getting attention in the late 1980’s when the construction of the new Chep Lap Kok airport became underway and the land reclamation project affected the area in Lantau; one of the major habitats of the dolphins. If your heading to Tai O in the hopes of seeing the beautiful creature I would definitely go with little expectations, we got lucky! And while I seem to find conflicting information about whether this species is endangered or not, the general consensus is that, sadly, the pink dolphin is on the decline. If you don’t want to take a chance on seeing them in their natural habitat I have heard that you can see them at Ocean Park water park, I am not 100% sure if this is the case though. After our high of seeing the dolphins we strolled across the bridge where the rest of Tai O was built; a tiny island 15 meters away from Lantau. 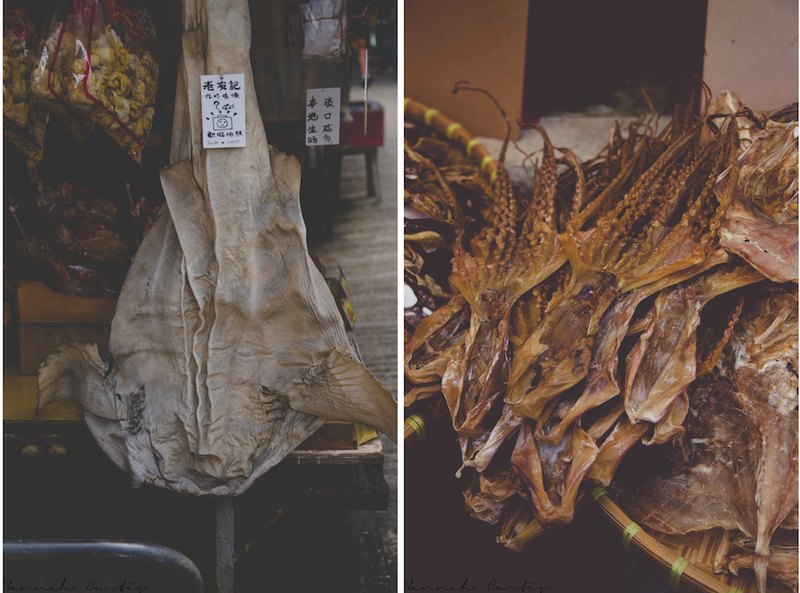 The streets are full of people selling dried fish, in all sorts of varieties as well as shrimp paste. I loved seeing the local people ride their bikes along the narrow roads and going about their daily routines. This was probably our first adventure where Eden really took note of her surroundings and asked a lot of questions in relation to how the locals lived. some of the many breaks throughout the day! We walked to Tai O Heritage Hotel, which I guess is only a 20 minute walk, but with two tired girls combined with the sweltering Hong Kong heat I am positive it took us a lot longer! The hotel was once a marine Police Station, built in 1902 but retired in 2002. After a restoration project it re-opended a couple of years a go as the Tai O Heritage Hotel which has a delicious lunch (and probably dinner) menu! I had hoped we would have been able to make it on one of the free guided tours which occur daily at 3 and 4pm, sadly the timing didnt work out for us. It is also worth mentioning that if you do plan to do the free guided tour I read that you must make online reservations, I am not sure how flexible they are if you just turn up, something to keep in mind! A short meander back to the village and we decided we should head back to see Tian Tan, unfortunately we didn’t think to check the bus timetable at the start of the day and it appeared we had missed the hourly bus by 5 minutes. We decided to splurge on a taxi only to have some other people beat us into the only taxi in site, sigh. Luck was totally on our side that day, as we watched the taxi drive away, we noticed bus 21 in the parking lot and moments later heading to the bus stop! My guess is that there were no patrons for the 2pm bus so they waited around in case some people showed up…which we did. Twenty minutes later we were back up the mountain. The 34 meter tall Tian Tan Buddha sits atop Muk Yue Shan and after you climb the 268 stairs you are rewarded with breathtaking views of Lantau and the South China Sea. With Clio in the ergo on my back and Matt carrying the backpack we did a little bribery with Eden to get her to climb to the top, and back…the promise of some shopping at one of tourist traps below. It worked, not only did she climb all the way up herself, she wanted to do and whizzed all the way up. When we returned we fulfilled our end of the bargain and she picked out a $1.95USD fan! The Buddha itself is pretty impressive, so huge and beautiful, built of bronze and weighs in at over a hefty 250 tones. At an extra fee you can enter inside and have some refreshments (I think) although we didn’t do this option knowing that the girls, mainly Clio, was getting to the end of her tether. Next to Tan Tian is the Po Lin Monastery, 100 years old and gorgeous but sadly we didn’t really explore it too much, a quick view but thats about it. I wished we had time to eat here as I read reviews that the vegetarian meal is fantastic, unfortunately we were still full from lunch for an early dinner. I now know how Clio looks like. The picture of you two on the bus and you have on a head band showed me the way. Kind of like Carrie and her Mom. Much fun. Great visiting with you Sunday. Interesting Mr C, I have to say I have never seen either Mrs C or Carrie in Clio although I would need a baby photo of them to really compare! I would say this photo isn’t a particularly normal one of Clio, her eyes are half shut but since I rarely post photos of both of us I thought I would add it anyway! I do think Clio looks a lot like Matt! I love that you travel so much with your littles. I need to get mine out there more. We don’t travel a lot and I wish we made the time to do so. How old are your kiddies? I thought once I had children I would want to stop traveling but in fact it makes me want to travel even more!! Even if you did a long weekend away somewhere (even within driving distance) I bet your kids would love! We are fortunate to have lived in some places which make international a lot more reasonably priced, but once we live stateside I am looking forward to doing road trips etc! Wow, I didn’t know you could see dolphins in the wild in Hong Kong! I went for this cable car ride when we had just a few hours to burn before our flight home. There was a super long queue for the glass bottom cabins when I was there! 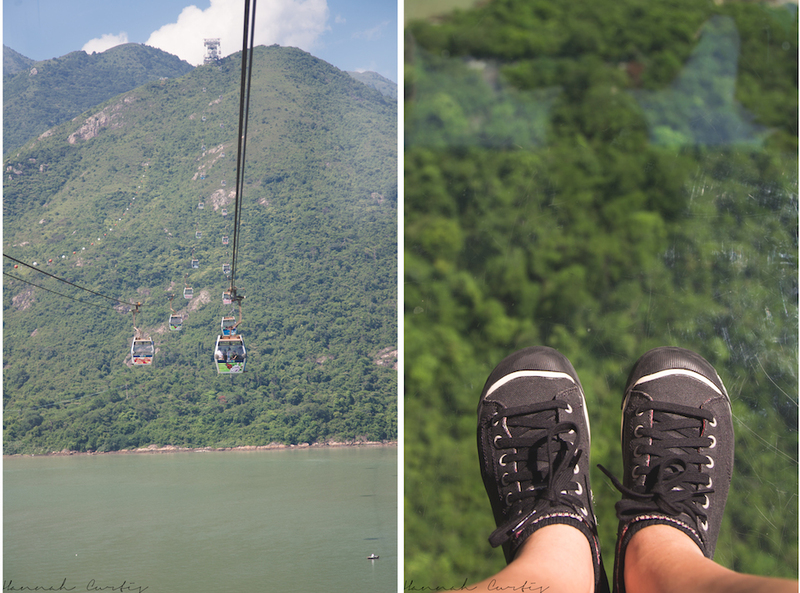 So we took the boring normal cable cars – because we didn’t want to risk missing our flight! We had just enough time to take the cable car, run up to the Giant Buddha, grab a Starbucks and take the cable car back. Pity we didn’t have time for Tai O. Yes, the dolphins were amazing, although it really is sad how their environment is being harmed. If you ever head back to HK definitely check out Tai O I think it may have been my favorite place while there, hard to say though because we loved it all! I am not a big fan of Hong Kong personally. I find it too similar to Singapore – equally overcrowded. I go on vacations partially to get away from the crowd, so I didn’t really feel like I was on vacation when I was in HK. But Tai O looks like a great escape from the city, I guess I should have gone there. It looks so much my kind of thing than hitting the usual tourist spots like Mongkok and Tsim Sha Tsui. You will have such a great time, there is SO MUCH to do there!